Every week, Shauna Ahern of Gluten-Free Girl and the Chef will be sharing smart tips and smarter recipes that will please even the most devout gluten-eaters among us. Come one, come all -- we're going flourless. Today: A riff on one of December's most famous cookies, minus the gluten. 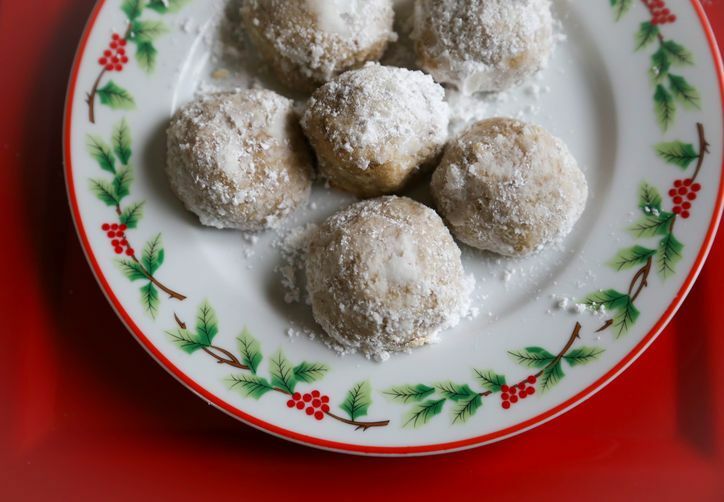 You might know these cookies by any number of names: Russian tea cakes, Russian tea cookies, Mexican wedding cookies, polvorones, or any other family names for little nutty balls of flour and butter, swathed in powdered sugar. For many of us, these cookies are the cookies for December. But what do you if you can't eat grains or dairy? A friend of mine in that situation wrote to me, wondering if I could help. She can eat coconut oil, not butter. Grains of all kinds make her feel sick. Is there any way to make these cookies for her Christmas season? My answer? Of course. Here you go, M.
More: Another thing you'll want for the holiday season? These gluten-free dinner rolls. Now, these aren't traditional Russian tea cakes. The soft, melt-in-your-mouth quality of the original is easy to replicate without gluten, but without butter, they're not quite the same. They are softer -- a little spongier -- than the originals. And is that a problem? Not in our house, where my husband and kid gobbled these up. And the fact is, if you wanted to forgo the powdered sugar, and not think of them as Russian tea cakes, these are ever-so-slightly sweet cookies that work well as a kid's snack. Rolled in a little chocolate ganache, they might be even better than Russian tea cakes. But you can make the denuded version in January. It's the holidays -- enjoy your powdered sugar! Why coconut oil and not butter? Any reason I can't use butter? Also, being such a traditionalist, I would prefer to leave out the dates. Are they essential for moisture? This page needs to be updated to include psyllium husk, since Gluten Free Girl forgot an ingredient AGAIN. oh man, these look incredible! Forgot how much I missed them! Think I'll try with butter as well -- same amount?